- More Shakespeare in the parks: Midsommer Flight, a new theatre group, will be doing free (donations happily accepted) productions this August. They are, unsurprisingly, doing A Midsummer Night&apos;s Dream as their first show. It&apos;s up August 18-19, 25-26 at Touhy Park. Their website is very green, much like the parks. There is a band and picnics are encouraged. 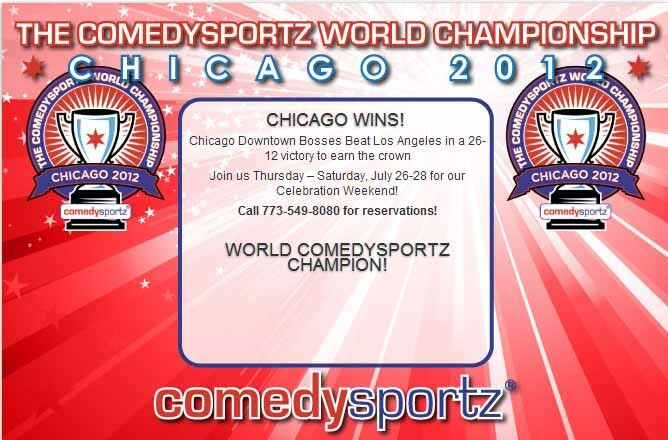 - ComedySportz Chicago repped their city and won the ComedySportz World Championship; the Downtown Chicago Bosses beat Los Angeles 26 to 12. They&apos;ll be celebrating this weekend and you can be there too. - Deanna Isaacs has an interesting take on the NEA grant given to fund Writers&apos; Theatre&apos;s new location in Glencoe; she&apos;s curious about the choice to better this already very wealthy community. "Has anyone from the NEA ever been to Glencoe?," Isaacs asks. "Because if the &apos;quality of life&apos; gets any better there, the whole village will just have to leave planet Earth behind and ascend to heaven." However, an anonymous commenter feels differently: "Writers&apos; Theatre&apos;s new space will help communities outside of Glencoe, the artists who work at the theatre (who are not Glencoe millionaires), not to mention the incredible educational outreach that the company brings to under-served student communities all over the Chicago area. Furthermore, any national spotlight and aide to any of our arts organizations helps to promote the entire Chicago artistic community," EES wrote. - Cirque du Soleil&apos;s Michael Jackson: The Immortal World Tour looked pretty big and beautiful this weekend; who saw it?